I originally wasn't going to post these pictures on my blog because of my awkwardly cut bangs - these pictures were from when I first got my bangs cut so they're shorter than my last post. Also, my hair is still wet from my morning shower and I had a train to catch in approximately 10 minutes while taking these pictures. Normally I would prefer to take my pictures after I come home from work but that would result in a sweat-drenched outfit post. I sound so attractive right now. The heat brings out my inner beauty and my sweat. I'm going to stay inside in the air conditioning and get some work done that I've been meaning to get done. Afterward, movie night with some friends, and then beach tomorrow morning to get my tan on. Burn, skin, burn! >:) Just kidding, I'll slather you up in 200 SPF sunscreen because I love you. I love this outfit! 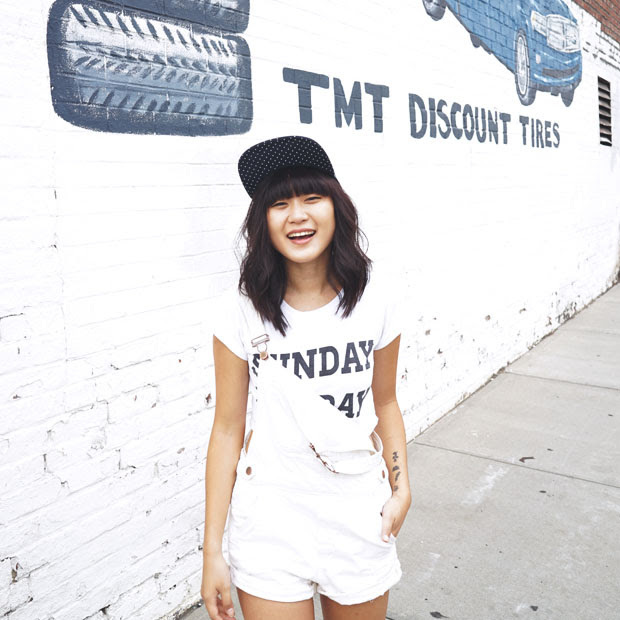 The print on this top is gorgeous. 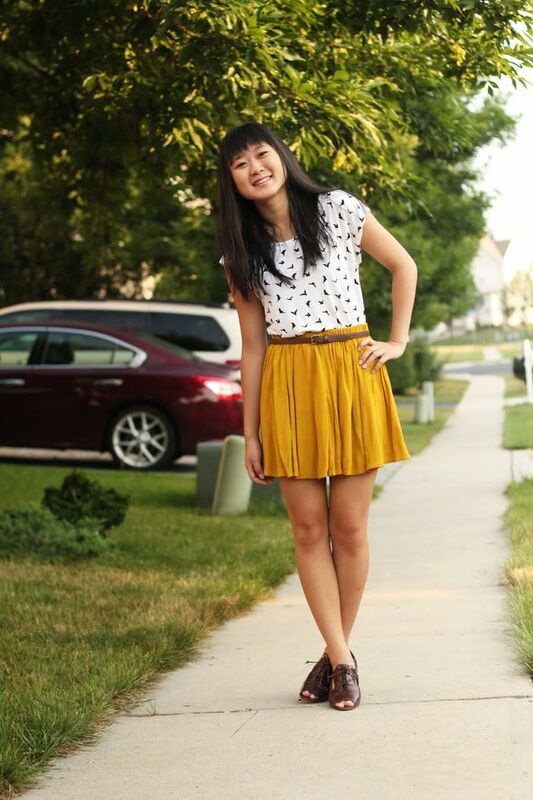 the printed top with that mustard skirt is just lovely! ahhh you got bangs! i think i'm behind on the times. they look super cute :) i had them this past fall and they're alot of fun. annoying sometimes, but fun. and killer shoes! Not awkward at all. Gross sounding? Nah. That's me too. I guess that makes two of us :) Also, those shoes are so adorable, I can't believe you found those @ csnstores! I find this to be the cutest outfit!! I love the blouse! And your bangs are cute:) You look a different person though with blunt bangs. It's interesting how bangs can change so many features. I hate taking pictures after work, or just at the end of the day. I always feel icky. Cute outfit! Love those shoes. this is such a cute outfit and i'm glad you posted it! 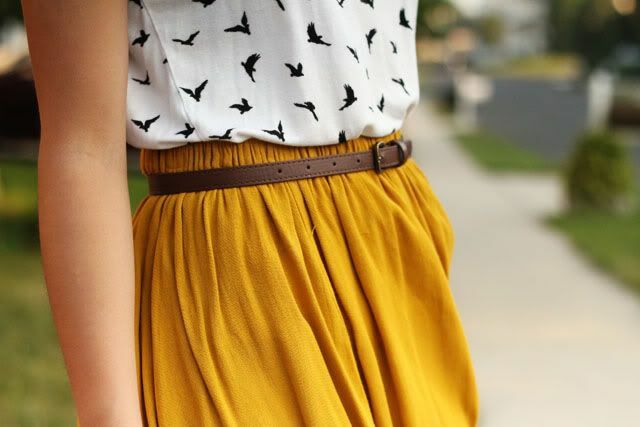 i love the pairing of the birds with the yellow skirt. so fun! I almost bought that shirt so many times! If I had gotten it, I probably would've paired it with your mustard yellow skirt too! MISS YOUUUUU!